Cut the tofu into cubes. Sprinkle with turmeric and cumin. Marinate a few hours or even overnight to let the flavors seep in (in my case I only let them marinate for about 30 mins while I chop up veggies and clean up after). Chop up peppers, cucumber and red onion. Mix together in a bowl. Add cherry tomatoes and Kalamata olives. Add 1 tablespoon extra-virgin olive oil and sprinkle a little more cumin on top. Toss to coat all vegetables. 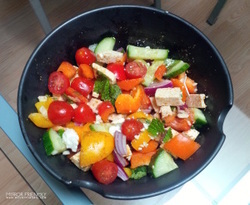 Now add the tofu and mint and toss to mix it in the salad. And that’s it! It’s refreshing and tasty and although it’s mostly veggies, you still get the protein from the tofu and I find this dish very filling.